This it was given us to know: that Corinne, a girl of not-so-ancient-name, and Tim, the not-quite-old one, would choose a movie to podcast about. 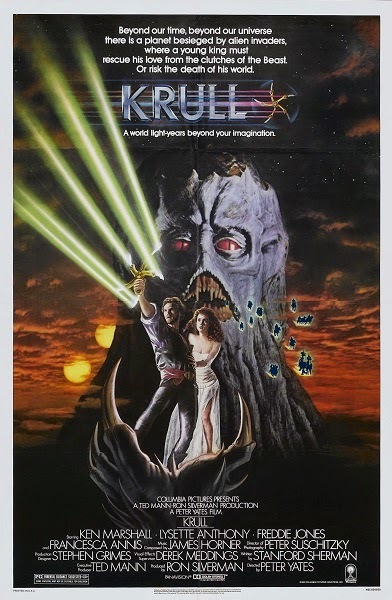 It's each to their fate as we delve into the cheesy majesty of Krull from 1983. Warning: Contains explicit language, spoilers, and speculative interpretation of ambiguous prophecies. Do you think Princess Lyssa should have chosen you as her king or queen? Got tips for glaive-handling without slicing off your fingers? Annoyed that Liam Neeson didn't get to exercise his particular set of skills? Leave a comment below and keep the discussion going. I've had a long, on again, off again relationship with this movie, as there's a lot that I like, and a lot that I don't. Its heart is often in the right place, though, which often makes a difference. One element that's always fascinated me is that this was written and shot as a pure fantasy, and all of the scifi elements were hurriedly stuck in there by the studio shortly before the release: all of the voiceover about the prophecy and how their son will rule the galaxy, the shots of the fortress floating in space (which was so rushed that it's littered with matting errors), and lasers drawn over all of the Slayers' single-shot harpoon guns, of which you can still see some harpoons after the "lasers" hit. All of that was just grafted on. You can almost understand the studio logic. Back before Lord of the Rings and Harry Potter, the fantasy genre seemed to be pretty tricky to market and hardly a sure thing. For every success like Conan the Barbarian or Time Bandits you had the sting of a financial failure like Dragonslayer. Post-Star Wars, it probably seemed like a surer bet to push the space opera angle. I imagine if they had planned it that way from the beginning, the Black Fortress might have looked a bit more aerodynamic. I also don't think I was aware of how the slayer weapons were originally supposed to function. It does helps answer the question of why the hell the slayers would choose to stop firing their lasers in favor of hand-to-hand combat. I admit a lot of my affection for this movie is probably a product of when I saw it. It's a lot easier to forgive plot inconsistencies and weird tonal problems when you're too young to know any different.